Revolvers are an ever popular platform that has been around since Samuel Colt submitted a British patent for his revolver in 1835. We have brought the revolver class back by popular demand. 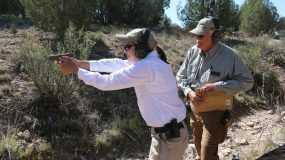 This class is “The Gunsite Experience” and was first presented in October 1976 by Colonel Jeff Cooper. Regardless of your age, gender or experience, completing the 250 class will change your life! 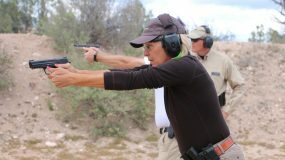 You will be well grounded in the ‘Modern Technique of the Pistol’, including marksmanship, gun handling and mindset. Through our systematic methodology you will achieve confidence, competence, new skills and best of all, peace of mind. Students emerge stronger, more alert, and conditioned to respond appropriately to any threat. 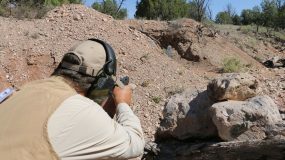 The 250 includes five solid days of range work, lectures, low light/night shooting with flashlight techniques and intensive indoor and outdoor live fire simulators. You will learn to be in control of your immediate environment. Can you shoot at night? Many lifelong friendships are formed with fellow students and instructors during this life changing week. Completion of the 250 course is a prerequisite for many other courses as this is where our core doctrinal principles are ingrained.